Among hotels in Chelsea NYC, our guest rooms make a major design statement. From warm wood surfaces and to rough-hewn walls, Hotel Henri offers a stylish backdrop for winding down after a day of business or urban exploring in New York City. 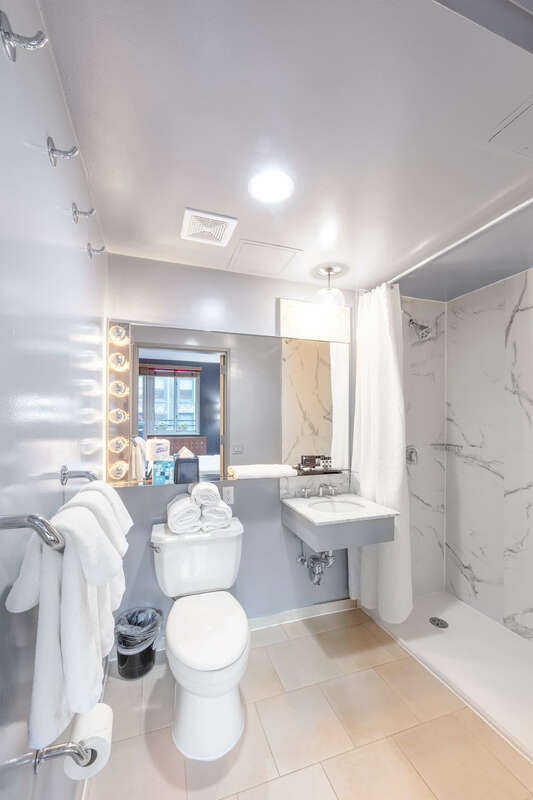 Get comfortable in our Deluxe King guest rooms with plush king bed, our signature lifestyle amenities, including a granite bathroom, a 32” HDTV, MP3 capability, WiFi and wonderful views of the cityscape. Perfect for families, our Deluxe Double guest rooms have two double beds and signature lifestyle amenities, including a granite bathroom, 32” HDTV, MP3 capability, WiFi and wonderful views of the cityscape. Located on the 16th floor, our Premium King with a Balcony guest room is furnished with a pillow-top king bed, large work desk and 42" LED HDTV, plus a granite bathroom. Sip your morning coffee or enjoy downtown New York City views with a cocktail from your private walk-out balcony. Local and domestic long distance calls from your guestroom phone. 24/7 access to our Business Desk (including printing). Access pass to Fitness Facility offsite at Equinox Gramercy. In-room bottled water with coffee, tea and Kcups. Luggage storage (same day) upon arrival and post checkout and an expanded amenities package. *This $25 Facility Fee is exclusive of service gratuities & applicable taxes and applies to all stays, per room, per night. *Rate plans and packages are excluded.